Grand Canyon University’s regular-season basketball finale at GCU Arena took on the usual look. Seniors were honored. Havocs were colorful. Lopes were victorious. GCU students chanted, “On to Vegas!” The men’s and women’s teams were previewing their first doses of March Madness rather than reviewing a season. The Lopes were on the cusp of their first Western Athletic Conference Basketball Tournament in Las Vegas. Majerle guides players though their final practice at GCU before they leave for Las Vegas – “a business trip,” as he reminds them. The Lopes are typically hard workers, but the gym atmosphere is even more serious because an NCAA tournament bid awaits the WAC Tournament champion. “If you’re not going hard, it never works,” Majerle says as they practice their offense. The Lopes open the tourney against Missouri-Kansas City, which they already routed twice by 17 points. Complacency could encroach if not for so much talk of being three wins from “The Big Dance.” GCU expects to hurt UMKC again with its size advantage. GCU’s WAC tournament era begins with a women’s game against Utah Valley. 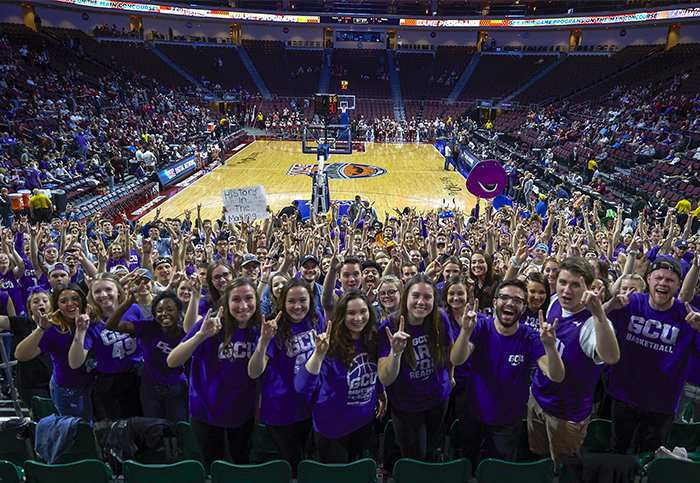 Costumed GCU students already are settling into Orleans Arena, facing the Lopes bench. After an off-site morning practice, the men’s team joins fellow students to watch GCU’s 72-56 win. The men tip off their first game at noon, their earliest start of the season. Associate head coach Todd Lee teaches a pregame locker room class on UMKC, detailing each player’s tendencies and reviewing colorcoded defensive schemes. An hour earlier, the Havocs began to fill one of the baseline’s bleachers, chanting “Where’s your pep band?” at UMKC. The Lopes gather beneath the bedlam, which builds their huddle into hops and chants. It proves to be nervous energy. GCU misses 12 of its first 13 shots to trail 20-4. The Lopes do not lead until the game’s 26th minute and fight for their season down the stretch. A Damari Milstead steal sets up Gerard Martin’s layup, cutting UMKC’s lead to one with 2:21 left. “It’s winning time,” assistant coach Chris Crevelone tells the Lopes huddle. GCU survives and advances. Majerle, Alessandro Lever and Oscar Frayer head to the press conference with the Havocs’ cheers still audible. “Can you say this all in Italian, please?” Majerle asks Lever, his Italian freshman. Semifinal day doubles the Lopes’ intrigue with the women and men playing to reach their respective championship games. The men stage a morning shootaround at a local YMCA before the women play at noon against Cal State Bakersfield, a team that they had beaten six days prior. This time, with star Brie Mobley making one shot, the Lopes trail 35-32 at halftime. Once “I Like to Move It” plays, the Havocs feel at home and Mobley looks it, too. She scores 13 of GCU’s first 23 second-half points for a 55-54 Lopes lead, but Bakersfield scores the game’s final seven points to win. The women sit crushed and quiet in the locker room, but the sounds of joy (Bakersfield) and anticipation (Seattle) are unavoidable in nearby locker rooms. More Havocs hit Vegas by the evening. A purple pregame pep rally welcomes fans to the men’s semifinals, which proves to be GCU’s finest moment. The morning’s hands-on coaching becomes a heart-to-heart pregame talk in the evening. GCU fans fill the section behind the bench. Havocs take over the baseline bleachers. Braun scores on the first play and the Lopes leap to a 27-9 start. Majerle claps and yells at the Havocs as Lever makes three consecutive 3-pointers. 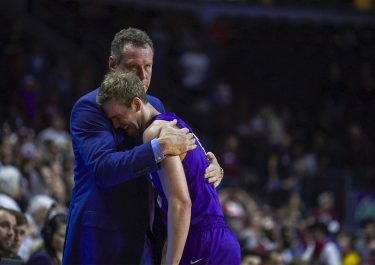 Majerle sweats through his shirt, expending the emotion and energy of a 40-minute player. GCU wins 72-56 with exceptional defense against the WAC’s top offense. “We’re going to the ’ship!” the Havocs chant before Majerle enters their celebration. With arms around each other, Braun and Vernon walk down an arena hall. “I love you,” Braun says. “I love you, too,” Vernon says. The “business trip” atmosphere continues for a championship-day shootaround at a local high school. There is levity when the team cheers Lee’s return from the restroom, but focus quickly returns. Eight hours later, the Lopes sit in an arc of chairs before a game that could put them in the NCAA tournament. Their opponent, New Mexico State, beat GCU twice during the season, but each loss felt like a win that got away. “After we score on that …” Majerle says about an opening play. GCU has won five in a row and has reached the championship of its first WAC Tournament. “Honest to God, you guys are already rock stars,” Majerle says. On national television, the Lopes grind defensively to lead for most of the first 16 minutes. The Aggies catch rhythm, overtake GCU and win 72-58. The postgame locker room is as silent as a grave with players’ heads buried in their hands. Vernon and Lever head for the press conference with Lever pulling Vernon’s head to his chest. An official delays them with the trophy ceremony within earshot and visible on a nearby laptop. Majerle paces. Vernon sits on the floor. Lever covers his face. As Majerle predicted, it was tough. “It just wasn’t our time,” Majerle says.